Dashi-Dorzho Itigilov (1852-1927)Dashi-Dorzho Itigilov (Russian: Даши-Доржо Итигэлов) (1852–1927) was a Buryat Buddhist lama of the Tibetan Buddhist tradition, best known for the lifelike state of his body, which is not exposed to decay. Itigilov was born in 1852 and began his religious education at the age of 16. He studied at the Anninsky Datsan (a Buddhist university in Buryatia, of which only ruins remain), earning diplomas in medicine and philosophy (the so-called “nature of emptiness”). At that time he wrote an encyclopedia of pharmacology. In 1911, he was appointed the 12th Pandido Khambo Lama (as the head of Russian Buddhists is styled), at which post he inaugurated the period of a Buddhist revival among Buryats. Between 1913 and 1917, Itigilov was prominent in the spiritual life of Imperial Russia. He took part in the Tercentenary celebrations of the House of Romanov and opened the Gunzechoyney datsan, the first Buddhist temple in St. Petersburg and indeed in Europe. The tsar had him invested with the Order of St. Stanislas on 19 March 1917. During the First World War Itigilov presided over the society of “Buryat brothers”, an organization helping the Russian army with money, provisions, clothes, and medicaments. He also helped set up a number of hospitals, with lama doctors helping wounded soldiers. For his charitable activities Itigilov was awarded the Order of St. Anna. In 1926 Itigilov advised the Buddhist monks to leave Russia, since “the red teaching was coming to land”, himself choosing to remain in the country. A year later, aged 75, he asked other lamas to begin meditation ceremonies and funeral rites, since he said he was about to die. Lamas did not want to perform this meditation because Itigilov was still alive. As a result, Itigilov began to meditate alone until other lamas joined him and soon his body ceased to breathe. Itigilov left a testament asking to be buried as he was at the time of his death, sitting in lotus posture. According to his wishes, his body was put into a pine box and interred at a bumkhan (a graveyard for the lama burials) in the locality of Khukhe-Zurkhen (Dark-blue Heart in Buryat language). One of the testament clauses stipulated that his body should be exhumed by other monks within several years. This clause is interpreted by enthusiasts to demonstrate Itigilov’s precognisance of his body’s incorruptibility. The exhumed body of ItigilovIn 1955 and in 1973, Itigilov’s body was examined by Buddhist monks, who were astonished to observe no signs of physical decay. They were too reluctant to divulge their finding to the atheistic authorities of Communist Russia and the body remained in situ until 2002. On 11 September 2002 Itigilov’s body was eventually exhumed in the presence of the leaders of the Buddhist Traditional Sangkha of Russia. The body was transferred to Ivolginsky datsan (a residence of today’s Hambo Lama) where it was closely examined by monks and, which is now more important, by scientists and pathologists. The official statement was issued about the body – it was “in the condition of someone who had died 36 hours ago”, very well preserved, without any signs of decay, with whole muscles and inner tissue, soft joints and skin . Although Itigilov’s body was never embalmed or mummified, it is said that his corpse still bleeds if punctured. The Buddhist monks approach him as a living person and shake hands with him. Some devotees even claim that Itigilov is still alive, only immersed in a hibernation- or nirvana-like state. “Buddhists say that only the most advanced masters can fall into some particular condition before death and purify themselves so that his dead body could not decay” . Some scientists explain the state of Itigilov’s body by abnormal quantities of bromine discovered in tissues and muscles. On 23 April 2003, the Buddhist conference recognized the body of Dashi-Dorzho Itigilov as one of the sacred Buddhist objects of Russia. At that time, they laid the foundation stone for a temple entitled Itigel Khambyn ordon and consecrated to Dashi-Dorzho Itigilov. As of 2005, Itigilov’s body was kept outdoors, in contact with other people, without preserving any temperature or humidity regimens. From: http://www.neplaneta.ru/hamba_lama.shtml – page no longer up on the server. “Exhumation of the body of Hambo Lama Itigelov took place September 10th, 2002 on the territory of cemetery near the city of Ulan Ude (Russian Federation). He died and was buried in 1927 and the exhumation was performed in presence of relatives, officials, and specialists”. This was the information that appeared in Russian mass media regarding Buryat Lama who was exhumed from the grave in the beginning of the 21 st century. The grave contained a wooden box and there was a sitting Buddhist lama in ‘lotus’ pose. His body was preserved as if it was mummified, however it was not. Soft muscles and skin, folding joints. The body was covered with silk clothes and fabric. Hambo Lama Itigelov is a real person quite well known in Russian history. He stidied in Anninsky Datsan (Buddhist university in Buryatia, nowadays there are ruins only) and got degrees in medicine and philosophy (nature of emptiness), he created encyclopedia of pharmacology. 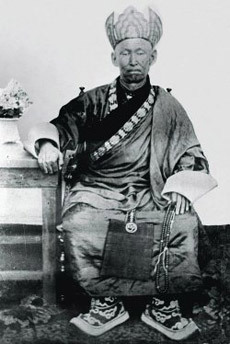 In 1911 Itigelov became a Hambo Lama (the head of Buddhist church in Russia). During the period from 1913 till 1917 he participated in social actions of the Tsar, being invited to 300-year anniversary of Romanov’s house, opened the first Buddhist temple in St. Petersburg, and Nikolai II gave him St. Stanislav award on 19 th of March, 1917. During the First World War Itigelov created and inspired the organization called “Buryat brothers”. He was helping the army with money, meals, clothes, medicaments, he also built a set of hospitals with lama doctors helping wounded soldiers. For that he got St. Anna award and others. In 1926 Itigelov advised the Buddhist monks to leave Russia, since ‘the red teaching was coming’ (Itigelov himself never left Russia). In 1927, being 75, he told lamas to begin meditation, since he said he was preparing to die. Lamas did not want to perform this meditation because Itigelov was still alive. Thus, Itigelov began to meditate by himself, lamas joined him and soon he died. Ititgelov left a testament where he asked to bury him as he was, sitting in lotus pose in the cedar box on traditional cemetery. It was done. There was also a statement, where he asked other monks to exhume him after several years. (This is the exciting point – this means he knew that his body would be preserved). This was done in 1955 and in 1973 by Buddhist monks but they were scared to tell everybody about this, since communist regime did not leave any space for religion in society. 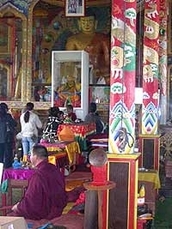 Only in 2002 the body was finally exhumed and transferred to Ivolginsky Datsan (a residence of today’s Hambo Lama) where it was closely examined by monks and, which is now more important, by scientists and pathologists. The official statement was issued about the body – very well preserved, without any signs of decay, whole muscles and inner tissue, soft joints and skin. The interesting thing is that the body was never embalmed or mummified. Two years passed. Itigelov’s body is now kept open air, in contact with other people, without any temperature or humidity regimes. How Itigelov keeps this condition, nobody knows. This is the ONLY KNOWN AND CONFIRMED CASE OF IMPERISHABLE BODY throughout the whole world. Embalming and mummifying is well known among different nations and peoples – Chili (Chinchora), Egypt mummies, Christian Saints, communist leaders and others. Some bodies were found in permafrost, however when they contacted with oxygen atmosphere they perished within several hours. However, there are descriptions of such things in Buddhist texts, but there are no confirmed examples. Well, now there is. For two years after the exhumation of Itigilov’s body it does not perish nor decay, no fungus, no negative things happen to it. Itigelov said before he died that he left a message to all peoples on Earth. This message contains no words. Now it is our turn to understand it. Then I spotted a lotus of a surely standing bodhisattva statue protruding from a cardbord box at a curb that was filled with refuse. Reaching in I was able to recover a 16″ tall statue in perfect shape. Ksitigarbha – in Indian language. Dayuan Dizang Pusa – in Chinese language. Sayi Nyingpo – in Tibetan language. Daigan Jizō Bosatsu – in Japanese language. Ji Jang Bosal – in Korean Language. his tomb was opened, only to reveal that the body had not decayed. 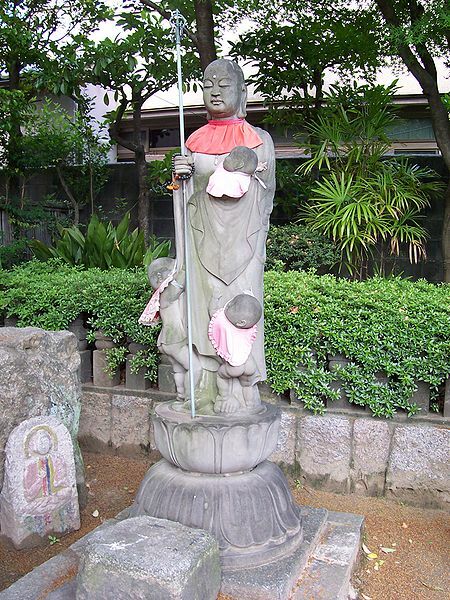 This picture is a representation common in Japan, Here the Bodhisattva is like a tree caring for many children. Picture on top of the post is a very similar to the statue that i found. In the middle of the week leading up to the 19th of June i had a dream in which i clearly saw Khenchen Rinpoche’s face and knew i have to go upstate. But although I knew that I should go upstate i did not recognize the face and did not really know where upstate should i go. So, naturally i let it “slip and slide”…. As I was able to join annual Fire Offering almost 3 times in John Di Jiorno’s “Bunker” (only one time for 3 days) and there also on many different dates received empowerments of Manjushri, 21 Tara, Amitabha, Medicine Buddha, transmission of Vajrakilaya practice, teachings on many subjects, I felt that One time now I should definetely travel. Khenchen Palden Sherab Rinpoche last words were in English: “Going Time” addressed to Jomo Lorrane. Remaining in meditation until the night from Tuesday to Wednesday. At some point during that night Khenchen Rinpoche released his meditation. All the ceremonies were conducted by members of Padma Samye Ling directed by Khenpo Tsewang Dongyal Rinpoche who was joined by the classmate friend of Khenchen Palden Sherab Rinpoche from the Riwoche monastery, Khenpo Sonam Thobgyal Rinpoche. There were many Padmasambhava Center members from all over USA as well as international Sangha members in attendance. Yesterday one of our precious teachers, Khenchen Palden Sherab Rinpoche, passed into parinirvana. 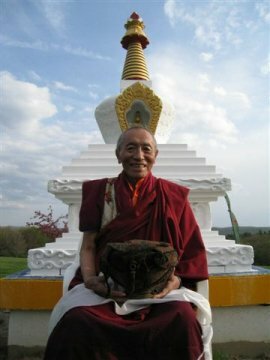 Over the years, many of us received profound teachings and empowerments from Khenchen Palden Sherab Rinpoche, mostly recently the Dudjom Tersar Wangchen in November 2007, bestowed at ODD. Ven. Gyatrul Rinpoche asked that an email be sent to our mailing list to request and encourage everyone to come for Guru Rinpoche Tsog Practice, tomorrow, Monday, June 21st at 7pm at ODD. Rinpoche has said that it is an important time for us to pray, practice and especially purify our minds through the recitation of the 100 syllable mantra of Vajrasattva. As a means to express our gratitude to Khenchen Palden Shearb Rinpoche, Venerable Khenpo Tsewang Dongyal Rinpoche and the PBC Sangha, we will be making a collective offering on behalf of our sangha. Please consider making a donation via the Paypal link below. And here is the text of the letter that Venerable Khenpo Tsewang Dongyal Rinpoche sent earlier today. On the auspicious day of Medicine Buddha, June 19, 2010 at 8:07pm, our most beloved teacher and one of the great scholars and masters in Nyingmapa Buddhism, Khenchen Palden Sherab Rinpoche passed into parinirvana peacefully and beautifully. All stages of meditation were perfectly demonstrated according to the teachings of the Buddha and Guru Padmasambhava, and as Khenchen Rinpoche himself taught for so many years. He entered fearlessly without any emotion or attachment, joyfully and with confidence at his home, Arya Palo Ling, in the presence of his beloved brother, Venerable Khenpo Tsewang Dongyal Rinpoche, and Jomo Lorraine, and during the sangha’s practice of Vajrasattva in the glorious Copper-colored Temple at Palden Padma Samye Ling monastery. Surrounded by every lush spring quality of gentle breezes, birds singing, flowers blooming, and deer playing in the meadows, he remains in thugdam meditation. Offering ceremonies began in India, Nepal, and Tibet immediately following Khenchen Rinpoche’s parinirvana, and beginning today we will hold 49 days of offering ceremonies at Palden Padma Samye Ling. We warmly invite the PBC sangha to gather together for these ceremonies. Soon we will be sending a schedule of all of the practices and services that will be held on behalf of Khenchen Rinpoche. Venerable Khenpo Tsewang Dongyal Rinpoche requests everyone to please recite the 100-syllable mantra of Vajrasattva. For those wishing to make offerings, please consider supporting the “108 Reliquary Stupa Garden” that will be installed at Padma Samye Ling in honor of Khenchen Palden Sherab Rinpoche. You can mail your offering payable to “PBC” to Palden Padma Samye Ling to the attention of: 108 Reliquary Stupa Garden. You possess the magical display of most glorious Vajrakumra. All-victorious embodiment of wisdom, to the lama I bow down. The sweet smell of saffron arisen from your ethical discipline pervades. Endowed with the three grounds of positive merit, to the lama I bow down. Beneficial action, glorious protector, to the lama I bow down. Bliss-gone one with perfect skill in the ten powers, to the lama I bow down. Living countenance that gathers the three families, savior, to the lama I bow down. Perfect monarch of these nine excellent manners, to the lama I bow down. Crown ornament of all teachers, to the venerable lama I bow down.